And just like that, we’re over half-way into the first month of 2018. I don’t know about you, but my days are flying by faster and faster as of late! 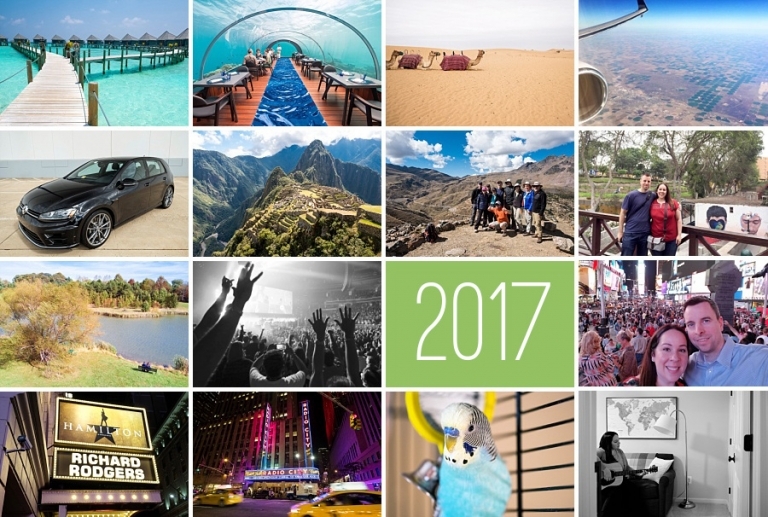 2017 was a big year for Chris and me in the travel goals department. We crossed off two more continents! Oddly enough we had yet to visit Asia, and we also set foot in South America for the first time. We tallied three new countries – UAE, the Maldives, and Peru. Instead of another overseas adventure, we spent the fall stateside by heading to New York to see Hamilton and to eat everything we could find. And earlier in the year, I flew out to Colorado to surprise my dad for a milestone birthday celebration. When we weren’t traveling, we filled our free time with concerts (twelve of them!) including 311, Foo Fighters, and my all-time favorite, Depeche Mode. I also jumped into the world of unmanned aerial systems this year and delighted in the technical challenge and wonder that comes from taking pictures with a drone. Speaking of hobbies, I finally picked up my guitar again and started to make some progress after feeling intimidated by it over the past couple of years. I won’t be playing any gigs anytime soon (or ever), but I have added several chords to my repertoire and I’m enjoying the learning process. In this-is-real-life fashion, I can’t report the good without also reporting the bad. My beloved car of eleven years finally started to give out on me in the spring. I survived a terrifying incident driving on the highway, driving at 65 mph when my steering wheel locked up and my brakes started shuddering. I couldn’t change lanes, and the brakes weren’t responding normally. Thankfully I was able to take my foot off the gas and pull over without getting into an accident. It turned out to be a faulty alternator (so all of my electrical functions like power steering and ABS brakes were going haywire). I ended up getting a new car just to be on the safe side and I absolutely LOVE it, but oddly enough, I keep cracking the windshield! I took a big rock to the window three times, including once just days after I had to have the whole windshield was replaced. It was not my year for vehicles. 2017 also ended on a bit of a down note with Marty getting sick and having to go in for an emergency vet visit, but as of this post he’s fully recovered! So on the whole, still not too bad. I recognize that I am privileged to be able to replace my car, and we lucked out with catching Marty’s illness early enough to treat it. Happy 2018 to you all, and I hope your year ahead is filled with health and joy!